Hard working, with ambitious dreams for a bright future, more easily united and more able to do different jobs compared to village men. Why the role of women is critical to long-term change. Shimla Maravi comes from the village of Kadgo in the Kawardha district of Chhattisgarh where most of the communities belong to the Gond Tribe. Shimla is 26 – the eldest of three children. Her family depends mostly on agriculture to live – they have a small plot of land on which they grow rice paddy, maize, wheat and chickpeas which brings in enough money to sustain them day to day. Her parents describe Shimla as obedient, disciplined and above all responsible towards her family. She’s bright and a keen student and despite their modest income, her parents were determined that she should atttend university, even if it meant selling their jewellery and other precious belongings to to pay for her tuition. Their sacrifice paid off and Shimla graduated from the local college with a BSc. Not long after, her village received a visit by staff from FRANK Water Partner, Samerth. In an early meeting with villagers, Shimla caught the attention of Samerth CEO Gazala. Her confidence and hard work stood out from the crowd. After the meeting, Gazala approached Shimla to ask whether she’d like to join the Samerth team as livelihood extender – someone who advises and supports others to improve and increase their income. Gazala knew she had something about her that other women and girls would respect and listen to. Shimla accepted immediately and launched herself into the role, attending training and workshops to develop her skills and knowledge. When Gazala told us this story, she described women in the villages as hard workers, with ambitious dreams for a bright future, more easily united and more able to do different jobs compared to village men. And It’s not just Samerth that recognise how critical the role of women is in bringing about change. Almost all government agencies and NGOs now focus on empowering women to strengthen vulnerable and marginalised communities from within. A strong female role model helps other women in the community to believe that change can happen. Shimla hopes to use her job to help the most vulnerable tribal women in the area by forming groups and supporting them to claim their rights to government assistance including education, health and livelihoods. Already, she’s outperforming expectations. She’s set up three different groups for women and helped another young woman find work. Girls and young women in the villages where she works seek her for advice across all areas of their lives. FRANK Water Founder & CEO, Katie Alcott is awarded an MBE! Katie Alcott, Founder and CEO of local water charity, FRANK Water has been awarded an MBE in the Queen’s New Year’s Honours List. Just a week later Katie had succumbed to the same fate, contracting amoebic dysentery from drinking dirty water in another teacher’s house. She returned to her family home in Herefordshire to recover – a process which took five years. In that time, Katie managed to complete a degree in fine art at Bristol’s UWE and travel to other parts of the world where she regularly witnessed firsthand the effects that dirty water has on health, education and development. Katie felt passionate about the importance of bringing safe water and sanitation to those living without it and in 2005, she founded FRANK Water. In its first few years, FRANK Water operated as a social enterprise, selling ethical spring water (sourced from a family-run spring in Devon) to local bars, cafes and festivals and donating the profits to a water, sanitation & hygiene (WASH) NGO in India. But word spread and the FRANK Water story captured people’s imagination – supporters started running marathons and jumping from planes to raise money. In 2007, Katie registered FRANK Water as a charity. Since 2005, FRANK Water has reached more than 386,500 people in 440 different villages, providing them with life-changing safe water, sanitation and hygiene education. The organisation has taken significant steps in the last two years, increasing its trailblazing festival refill work in the UK, expanding water and sanitation work into Nepal as well as launching a pioneering water resource management programme in India with Arup and local partners which has the potential to influence how water is managed over large catchment areas globally. This Sunday, FRANK Founder and CEO, Katie sets off for India. She’s visited countless times before, as you’d expect but this time, it’s a trip with a difference. Accompanying Katie will be her husband Tom & their three children. Why? 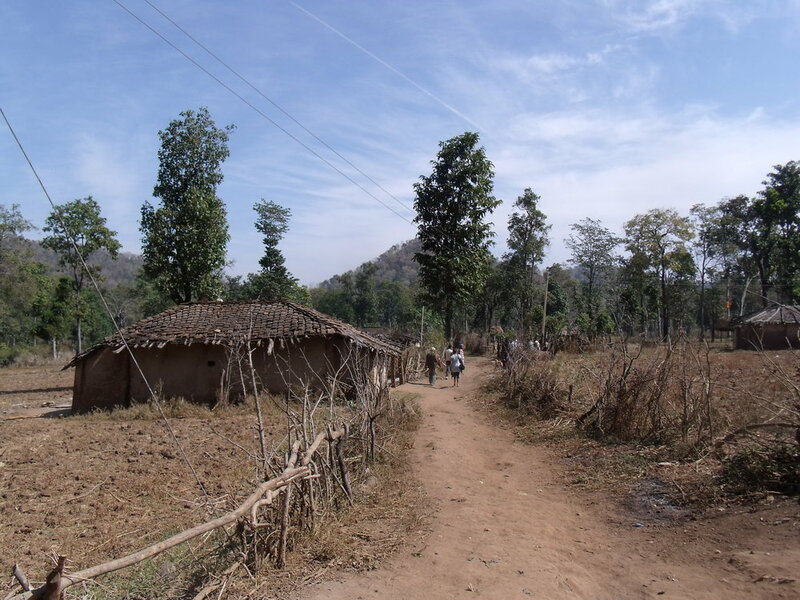 To take part in the inaugural Walk for Water - a four day tour through India’s Chhattisgarh. We spoke to Amelia, Reuben & Elodie to find out how they were feeling about the trip, what they were most (and least) looking forward to. Tell us what you’re looking forward to…! 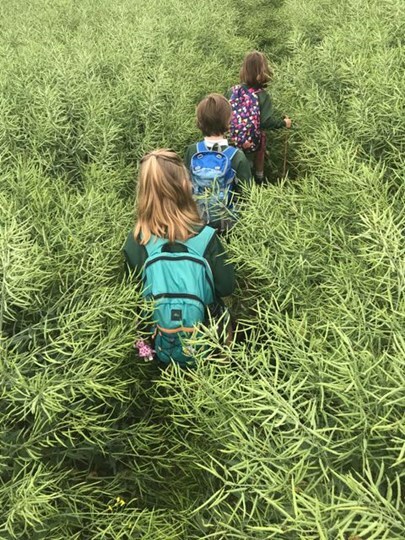 A: Finding our way on the walk! Seeing how the people live and cook food, seeing where people get water from, where they go to the toilet! E: …We will be camping in one of the villages!! I am a little bit scared of the insects biting me!!!!!!! In what ways do you think walking in India will be different from walking at home? E: There are different plants - called touch-me-nots - that explode when you touch them! R: Walking over the Malvern Hills. The walk is the about the same as walking the Malvern Hills end to end and back again... but it's much higher! E: By walking our dog! How are you going to fundraise for your walk? A: By setting up our JustGiving page - and asking friends & family to sponsor us. Lily (25) and Emma (26) have been friends for over ten years. They grew up in the same town of Hay-on-Wye and were introduced by mutual friends. We caught with them both before they head to India to take part in FRANK’s first Walk for Safe Water! Lily: "I thought Emma was really cool, wanted to be her friend, so I invited her to a party and we’ve been friends ever since. We both ended up going to Leeds University - though Emma was in the year above me and was able to show me the ropes whilst I was there. We’ve travelled together before, but only to go partying in Croatia, Spain & France which involved zero walks so this is a new one for us!" Lily: I’ve been to India a few times before. Because Mum runs an Indian travel company, I’ve gone with her on trips out there – and feel so lucky to have done so. This time, Emma and I are spending three or four months out there (before and after the walk). We’ll be working at Bhoramdeo Jungle Retreat (the guesthouse where walkers will stay during their trip), helping Sunny host his guests. It’s an amazing place…like going home. Even guests who’ve never been there before say that. It’s so comfortable and comforting, the staff are just unbelievably kind and attentive - it feels like the heart of India. Emma: I love walking. I’ve had plenty of practice given I live in mid-Wales so there are hills and mountains everywhere. I love seeing cities but am drawn to rural areas and am far more excited about seeing villages, meeting people and being immersed in rural life. Lily: The people from the villages nearby live simply but they make it work. You see traditional styles of farming, houses painted bright blue (to keep the flies away) and crops hanging from the rafters. Sunny knows everyone – head out on a bike ride with him and you might suddenly find yourself making spinach pancakes with a 60 year old lady and her granddaughter. Most days consist of early morning bike rides, watching the sunrise and then after the heat of the day has died down, there are amazing walks through forests or villages, planned by Sunny. Emma: I’m so excited about going back to India – I’ve been once before, back in 2012 and spent ten days at BJR where I did some work in local schools, giving basic English lessons and planting trees among other things. Emma: Being at BJR was the only time that I did really get to meet people – Sunny is a lynchpin, he knows everyone. We did lots of walking round, meeting people and spent time in an old potters village. Lily: As well as helping Sunny, we’re planning to work alongside the little sewing school that Sabi (Sunny’s wife) has set up. It’s been going for around 18 months and mainly teaches local women how to make their own washable and reusable sanitary pads. In India, there’s still some stigma around periods and menstrual hygiene and women often use rags or papers. It’s such a simple idea but is changing women’s lives. Because all the women from the village are involved, it means there are often dozens of children playing outside whilst their mothers are sewing. Emma and I are planning to organise some activities for the children – singing songs, playing games and doing a few simple lessons. Lily: This will be the longest time I’ve spent in India. I’m not too worried about the walking – I did the Welsh three peaks challenge recently – it rained constantly other than one 10 minute break in the clouds at the top of Cadr Idris. Our India walk will be a bit different to that! Emma: Lily and I are hoping to fundraise our sponsorship by hosting a dinner for friends. We’ll try and get free food and drinks and charge guests to attend. It’s a great cause so I think people will be glad to support. Now we just need to decide on a theme! To anyone who isn’t sure about visiting India or taking part in this walk, I’d say that people have such warm hearts, they genuinely want to know more about you and welcome you into their homes. They’re full of both pride & love. It’s such a loving place & the real heart of India. Emma: India is a fascinating place. When I talk to people about it, some are excited and others not at all. But I think it’s really important to try and have as many different experiences as you can, whenever you can. This November, we're walking for water. With our partners at Holidays in Rural India, we've built a tailormade four night tour of India's Chhattisgarh that includes some of the very best sights and sounds that the country has to offer. Along with beautiful, comfortable and friendly accommodation, knowledgeable, enthusiastic hosts and fabulous food, the short trip includes time spent in villages that FRANK Water has worked with, and a chance to find out more about life in rural India. The trip is popular and there are already ten people taking part. And it's a group with a difference - ranging in age from 7 - 73 years old and mostly women, it's set to be a lively, interested and interesting bunch who'll make great travelling companions. In the first of a series of blogs, we caught up with Gwen, 46 who's taking part with her mother, Ann, 73. 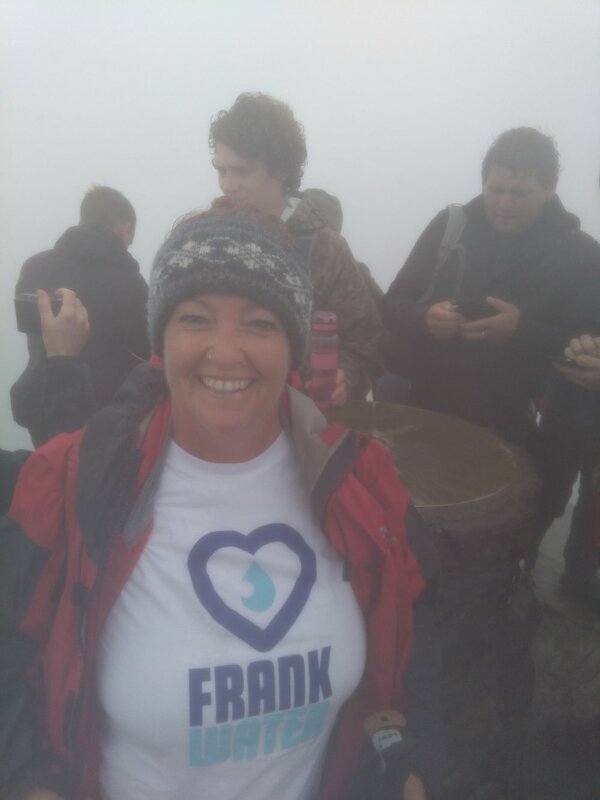 We chatted to Gwen as she made her final preparations for a trek up Mount Snowdon which she hopes will help fundraise the £250 donation to FRANK Water that every participant is asked to contribute as part of the trip. She told us what she was most looking forward to and explained how India continued to surprise her. “I’m one half of Indian Experiences – we help market small, experiential travel companies – and we’ve just recently started working with Holidays in Rural India. Having spoken to Sophie and heard more about the Walk for Water trip – just one of the many that they offer, I thought it sounded perfect – not only could I raise funds for FRANK Water and give something back, but also it’s an opportunity to see a part of India that I’ve never visited. My Mum was immediately interested too – she’s a big traveller and she and I went to India last year for the Jaipur literary festival. She was keen to go back but she’d had enough of the busyness and chaos of cities and wanted to see a quieter side of the country. She loves walking too – so this trip was made to measure. What I’m most looking forward to is meeting the people that live out there – looking at monuments and visiting museums is one thing but India’s people are what makes it. Although I’m a veteran traveller to India, it’s never ever repetitive. Every time I go, I see something different and unique. And this trip will be no different – meeting some of the tribal communities that live in Chhattisgarh will be a highlight – those that I’ve met before were completely unused to tourists and amazingly friendly. I want Mum to see a different side to the country too. For anyone who’s not sure about taking this trip, or who’s never travelled to India before, my advice would be to ignore any negative impressions you have – whether of the poverty or pollution – go there and find out how warm the people are and how poverty is often relative." or contact Holidays in Rural India for more information and bookings. energy into creating Kabuto Noodles. preservatives, flavour enhancers or nasty things like palm oil. helps out when she can, volunteering for FRANK at festivals on their refill stations. This day two years ago I was three weeks into a walk around the South West Coast Path. The walk covered 630 miles on the official path and another 400 miles finding my hotels and a bite to eat. For nine whole weeks I walked for six days and then took a day off to rest (and wash my clothes). It was a truly amazing life experience, but it was not all fun. There were days when it rained – a lot. Some days there were severe ascents and descents. On more than a few days my body, especially my feet were not really up for another walk. 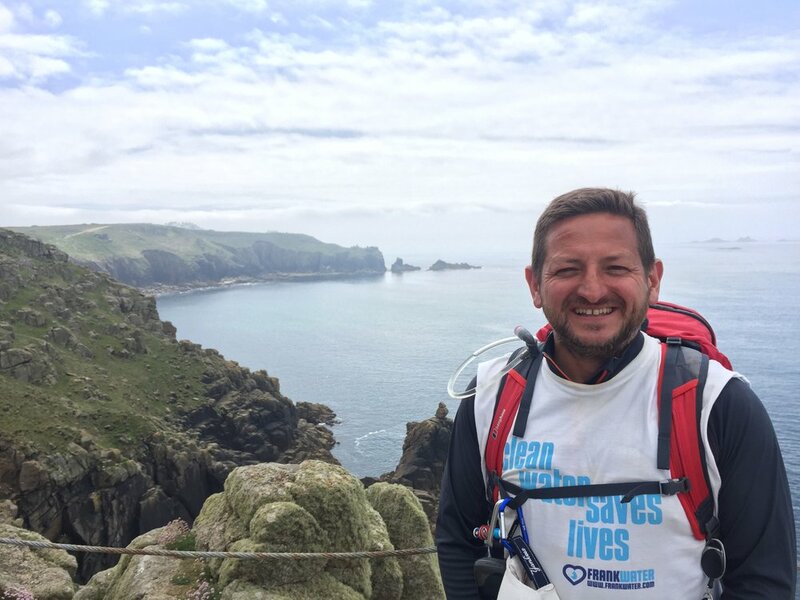 BUT on those days, I took comfort in the fact that my walk had raised nearly £10,000 for a great cause and that I was also proudly wearing my “Clean Water Saves Lives” T-shirt which gave me the opportunity to talk to passers-by about the work that FRANK Water do. Last year I had the opportunity to travel to India and see three villages that are benefiting from the funding and huge amount of work that goes into improving the water and sanitation by the team at FRANK Water and the NGO’s they work with. I’m immensely proud that I have been able to contribute to their efforts. 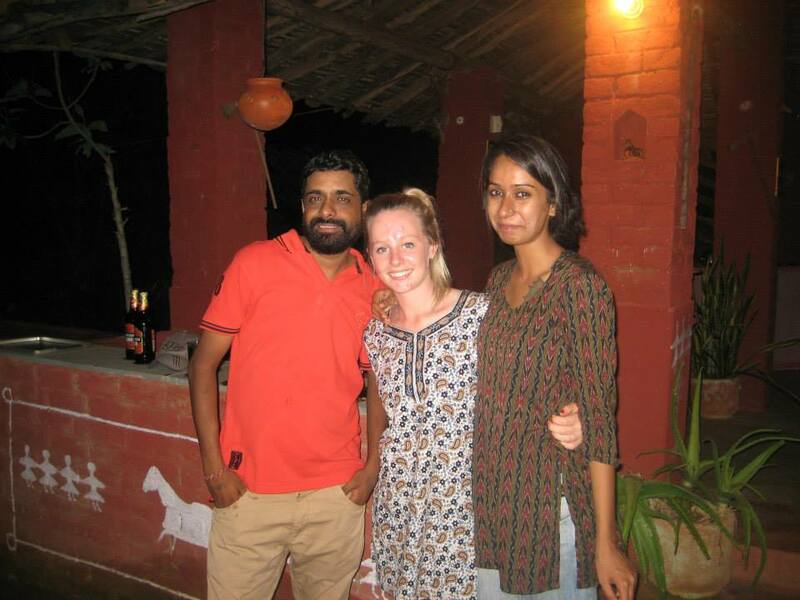 During that trip I stayed at the Bhoramdeo Jungle Retreat where I was looked after extremely well by Sunny and Sabi. It is set in the foothills of Maikel Hills in the district of Kabirdham – three hours from Jaipur – and is a truly beautiful place. We walked through rural villages, visited a temple and dined outside for delicious dinner, breakfast and lunch – all served with added charm from Sunny. Fast forward to today and we have just signed a three-year agreement between Bart and FRANK Water. This commitment forms part of our newly written Bart Corporate Social Responsibility strategy and strengthens the relationship between both parties. We are planning events, special product launches and even more engagement from the teams at Bart and FRANK Water. I’ve been a volunteer for FRANK Water for several years and as part of that I helped out at the Dart 10k swim two years in a row. I absolutely loved the atmosphere of the swim and it is in an incredibly beautiful location, so beautiful in fact I decided to move out of Bristol and down to this amazing part of South Devon last year. The Dart 10k is so impressive! Seeing all those hundreds of swimmers filling up the deep, dark estuary is inspiring- particularly if you are on a floating island feed station positioned half way through the swim, tasked with chucking jelly babies into swimmers open mouths (just like feeding time at the zoo). I’ve promised myself having moved down here that one day I will do the Dart 10k but I’m not quite ready yet, it’s very deep, full of mud, fast flowing and there’s quite a few boats (including a passenger ferry) to avoid- definitely a challenge. So, with a view to one day building up to the Dart 10K I was so excited to hear about another swim, the Bantham Swoosh only 20 minutes away from my house but heading down a much shallower, sandy, warmer estuary and ending with a little push out to sea. My friend Steve and I decided to sign ourselves up for the challenge and raise money for FRANK water. I had done one swim event before but it was only a mile in a lake and several years before when I was much more into my swimming. I love to be in the water but I am not a natural swimmer and I was certainly very unfit when I started my training (marginally fitter by the end). I set myself an intensive training plan with swims 3 times a week building up my distance each time and an outdoor swim in the sea or the estuary at least once a fortnight (I’m very lucky to live just 20mins from the coast and 10mins from the Dart). Of course, I didn’t stick to that plan at all! I did make myself go in cold water as often as possible but the first few times in early April I barely stayed in 5 minutes (due to brain freeze and feeling like my face was going to fall off) and there were times when I just couldn’t face it. I was worried I hadn’t done enough distance before the event, I think I made it up to 4km once or twice in the pool and the furthest I did in the sea was a mile. I also found out I have a massive irrational fear of swimming in the sea due to what might be lurking in the murky water- seaweed, SHARKS, bits of plastic that look like jelly fish, SHARKS, bottles hitting you on the head, SHARKS, other swimmers, SHARKS- you get the idea. One day, I saw a seal on one of my swims and ran across the water back to the beach and didn’t go back in for a couple of weeks! I thought I would make up for my lack of training just before the event but of course I caught a cold and had a big contract at work which meant I had no time for extra training. To make maters worse just the week before the swim, news broke of the UK’s first ever shark attack and guess where it was- you guessed it- BANTHAM! OK so the guy had a bloody thumb and the shark was about the size of a cat, but still, now I was even more afraid of swimming in the open. On my last pool swim, I managed to rip a gaping hole in my costume and the night before the event I was desperately patching up my wetsuit which had been left in the car in the sunshine and melted along the seams - none of this seemed like good omen. On the day of the swim we got up super early and drove to the finish at Bantham beach, we were doing the dawn swim (they time it to be with the tides either dawn or dusk) it was pretty grey and rainy, we got in to our wetsuits and waited around shivering (not a good start) to get a coach the 6km back up the river to the start. We were briefed and told to swim breaststroke for the first couple of hundred metres as it was a bit of a bottle neck where we got in and they didn’t want people swimming over one another. It was a bit nippy and a bit soupy (full of little bits of debris) when we first got in and being well behaved myself and Steve swam the first few hundred metres together in breast stroke (most people didn’t they just ploughed ahead in front crawl) but it wasn’t a mass start, it felt very relaxed and exciting rather than scary. We separated (I’m a lot slower than Steve) and put our heads down to swim front crawl. The whole time I was swimming I felt well looked after and safe, I could see life guards on surfboards at all times and 90% of the time I was surrounded by other swimmers. Once the estuary opened up it was beautifully clear and there was plenty of space, it also wasn’t too deep so if I had needed to I could have put my feet down, but I never felt like I needed to stop. I even enjoyed seeing the crabs scooting along the bottom and never even thought of the ‘S’ word during my swim. I paced myself and didn’t worry too much about all the people over taking me, in fact I was quite surprised when I got to the part where I could see lots of boats as I knew that was quite close to the end and I thought actually I probably could have swum a bit faster. I was really looking forward to the swoosh part (the current picks up at the end and pulls you in to the beach) although I didn’t feel the full effects of it until right before the finish line (which was a bit disappointing). I let myself float along on my back for the last hundred metres and felt very relaxed when I got to the end and was helped out by volunteers and given a beautiful big warm fluffy swoosh towel. I absolutely loved my Bantham Swoosh experience and I would encourage everyone to have a go. 6km seems like a really long way but its surprisingly not that bad and even if your training doesn’t go anywhere near to plan its definitely still achievable. I just kept saying to myself even a log that can’t swim at all will eventually get to the end due to the pull of the tide so don’t worry. It’s a very gentle ease into outdoor swimming events, with it being sandy, shallow, reasonably warm (compared to a lake or deep river) and with the bonus of a little extra help from the swoosh. So go for it- you won’t regret it. One day I will be back to tell you about my Dart 10K experiences, but not until I have spent some time trying to get over my SHARK fear. FRANK Water is a charity partner to the Bantham Swoosh, the Dart 10K and the Windermere One Way Swim. If you'd like to take a leaf out of Chloe's book and don your wetsuit for FRANK Water, email Amanda@frankwater.com to find out more. Most of our daily work at FRANK Water, and especially in India, is about taking stock – of situations, projects, funds and relationships. The end of the calendar year then, is just another occasion to take stock of the year as it unfolded, to note the highs and the lows, what keeps us upbeat about our work and what we hope in the year ahead. The following is then an account of some observations from programs and a few lessons that I think my colleagues would agree with. January at FRANK Water sounded like those bees in high Himalayan meadows, busy with too much to gather and too much to explore. Most of us were involved in setting up new partnership and FRANK Water's small steps into Nepal. By the end of February we were almost ready to begin operations in Nepal with our first partner – Friends’ Service Council Nepal (FSCN) in Kathmandu. There were equally compelling reasons to consider working in Nepal’s terai region. But our experience of working in such remote areas was limited to India’s geography. To do the same justice in Nepal required more time and resources that could be committed at that time. With the distance of these months, we can see now that in the intent of doing real, absolutely need-based interventions is also a matter of making difficult choices. There we were - looking at a glaring need for the kind of infrastructure we support in building in Nepal’s far-Eastern villages and at the same time feeling limited by our need to deliver on it to a satisfactory level. Work not done, is sometimes better than work done that is incomplete or one which works up hope among people but doesn’t deliver. We stepped back. The new financial year began with equally fast pace of activity in India as well. We got back to our partner VJNNS with our friends at Arup, to begin understanding how our (and other agencies’) work in supporting gravity-based water systems is affecting the environment and especially, water resources at a catchment scale. This was the kind of work we hope to do more of, in years ahead i.e. to complete the chain of problem-intervention-change-assessment-follow-up. The follow-up part of our work was enhanced this year, especially with Arup’s support. Long term monitoring is being strengthened and we are glad that this could happen. The other major change that my colleagues Jon and Praveena have contributed the most is introduction of Adaptive Programme Management (APM). Our programs need to change, as the social, political, financial and environmental contexts changed in the areas we work. A hard set program would render the intervention ineffective and more importantly irrelevant. Hence, this was done on priority. This has been conducted through the year with some of our partners. And we plan to carry it forward next year as well. Our partners now operate with a confidence that they can change a program’s specifics should there be a need to. We will have results to share by this time next year. When I hear the gurgling stream of water flowing out of the pipe that brings it from high mountain springs and down the course see a kitchen garden flourishing in that water, in the hills of Eastern Ghats, I imagine this gentle, elegant and beautiful. It is perhaps this ears-to-ground style of working at FRANK Water that helps its partners find confidence in working together. In the last few months of 2017, we have had two large, multi-year partnerships coming through. These, in part, are a validation of our work and of the spirit that we espouse. We close the year with confidence and faith in the work that we are committed to. Floods in South Asia have affected more than 41 million people across Bangladesh, India and Nepal. Whilst FRANK Water is not an emergency response organisation, when the people we work with are affected by natural disasters, we aim to support them as best we can and keep in close contact with our partners in India and Nepal. Our NGO Partner in Nepal, FSCN, recently sent us this report to describe the situation in the Terai area of Nepal, where we work. 'As detailed by the report of Nepal Red Cross Society (NRCS), Nepal experienced a period of sustained, heavy rainfall resulting in widespread flooding across 28 of the country’s 75 districts. The same report counts 149 people dead, 27 missing and 134 injured. Almost 64,997 houses have been destroyed and a further 14,4973 houses damaged or partially destroyed. An estimated 92,216 families have had to leave their homes to live in informal shelters including schools. Some 40 communities across the country remain inaccessible. Flood has affected numerous districts of the Terai belt of Nepal and FSCN (Friends Service Council Nepal) and National Disaster Management Network Nepal (DiMaNN) have distributed relief materials to a total of 200 households in the most severely affected, hardest to reach communities in the region. Together, FSCN and DiMaNN have distributed food to each household (including 5kg flour, 1kg salt, 1kg sugar, 1kg lentil and 1 litre of oil) as well as hygiene kits (5 bathing soaps, 3bars of soap for clothes washing, 4 toothbrushes, toothpaste, ladies underwear and sanitary pads/clothes for each household). As well as practical support, FSCN, DiMaNN and Forum for Protection of Consumer Rights Nepal (FPCRN)'s study team have spent time visiting various areas of flooding to meet some of the people affected. They've produced a written analysis of the situation in seven different districts that they'll share with the government, non–government, media and other key stakeholders to help inform short and long-term planning. How FRANK Water got to Nepal - a blog from FRANK Water's India Coordinator, Praveena Sridhar with her experiences and impressions of her visit to Nepal. Does Nepal need another charity? Does Nepal need another charity - a blog from FRANK Water's India Coordinator, Sachin Tiwari with his thoughts and insights into Nepal, its landscape and where FRANK Water fits in. Vin2o has worked with FRANK Water for nearly two years. Vin2o import and sell great wine, working with smaller producers, who are passionate about wine-making, and who look after the environment. For every bottle of wine they sell, they donate 25p to FRANK Water. Here, Chris Coles, Founder of Vin2o explains why he supports FRANK Water. Did you use your phone to order your lunch today? Or park your car? Or pay for your coffee? There’s nothing inherently wrong with doing any of these things. The world seems to be offering us more and more ways to save a minute here, or a few seconds there, or to free us from the burden of remembering this or that, all in the name of convenience and progress. For me the problem with this is that a lot of bright, talented people are using their skills and creativity to fix really small problems, often problems we didn’t know we had. After all, before we could pay for coffee with our phones we all still managed to pay for our coffee. What if all that enthusiasm and intelligence could be used to try and fix a big problem? What if instead of fixating on marginal gains and increments of convenience we committed to fixing something huge? What if we poured our abilities and time into something that would make a fundamental difference to people’s lives? The thing is that “big change” seems difficult. It seems like the preserve of experts, or scientists or nobel-prize winners. But I disagree. Big change can be achieved by anyone who points their energy and talent in the right direction. When I decided to start a business I knew I wanted to aim for big change rather than marginal gain. The goal of the business is simple, create great wine and use the profit to help fund clean water projects. One of the advantages of have a clear goal is that suddenly a lot of other elements become easier. We only work with producers who are passionate about wine making and care about the environment. 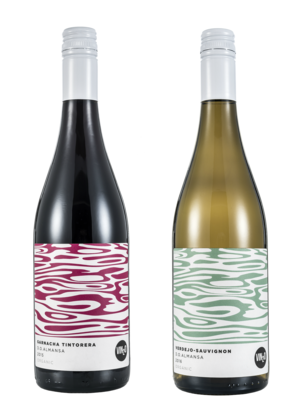 Our latest range wines are a pair of Organic Spanish wines made by a family producer is Spain whose winery is 100% powered by renewable energy. Our new red is a Garnacha Tintorara, a variety native to Almansa in southern Spain where it is produced. It’s deep red and full of summer fruit and sour cherry flavours. Our new white is a Verdejo-Sauvignon blend, a crisp fresh white full of lime, pear and tropical fruit. When you’ve got a clear goal and a great product all you need is great customers. That’s why were listed in places like The Ethicurean, The Yeo Valley Canteen and Novel Wines. I also needed a charity partner that can make Big Change happen and that’s why I support FRANK Water. They have provided safe water to over 330,000 people across India and that’s BIG CHANGE. That’s people being healthy, that’s children going to school, that’s women freed from drudgery, that’s dignity for all. Every bottle of wine we sell helps to fund the vital work that FRANK does. Our wine won’t save you time, or make your existence easier, but for someone else it could be life changing, and I’ll drink to that. You can be among the first to taste Vin2o’s new bottles at FRANK Water’s Karma Comedy night – along with our friends at Novel Wines, we’re kicking off proceedings with a wine-tasting reception, to be followed by a feast from Thali Café and laughs from award-winning comedian Ahir Shah. Tickets are just £40 – and every penny of profit funds FRANK Water’s work. 22nd March is World Water Day! Find out more about our partnership with FRANK Water here, and support FRANK Water's World Water Day campaign here. FRANK Water is an Arup Strategic Partner for 2016-2019. Drum roll please! We're thrilled to announce Anita Rani is FRANK Water's newest charity patron! Strictly superstar and BBC Countryfile presenter, Anita Rani has been announced as patron of UK water charity, FRANK Water. Anita first lent her support to the charity by voicing FRANK Water’s Radio 4 Charity Appeal in July 2016. The appeal, which aired twice in one week, raised more than £15,000 for the charity. As well as her star turn as a celebrity dancer, Anita is best-known as presenter on BBC One’s Countryfile. She has also presented and co-presented a number of factual programmes on India, including The World’s Busiest Railway Station for BBC Two, part of BBC’s major India season in 2015. This World Water Day, Anita Rani is supporting FRANK Water’s #Drop4Drop Appeal. From 22nd March 2017, all donations (up to £2500) will be doubled, giving supporters the chance to make double the difference. Donations will be matched by Blue Sky Botanics - one of FRANK Water’s corporate partners. I am a runner already and in fact, I’ve run the London Marathon before, 15 years ago but every time the event comes around in April I watch in absolute amazement at all the runners, the fun they appear to be having, the support that everyone of them receives along every inch of the 26 miles and, of course, their huge achievement. So I decided I’d like to have another go - join the thousands that tread the pavements of London and compete with the world’s elite at the same time - there aren’t many sports events that you can boast that fact! I do also have a personal agenda - that is to beat my time of fifteen years ago, 3 hours, 31 minutes, this is where I may have bitten off more than I can chew! So I begin to train, following a 16 week marathon programme and within a week I realised just why I had chosen not run a marathon since 2002! It is the amount of miles you have to rack up, relentless and the timing of the marathon means that the long winter runs are done in the cold or the wind or the rain and very often all three. My whole body, especially the legs, feel sore and tired all the time, I thought that as I became fitter, all the aches would subside and then I’d adopt that effortless running style of Mo Farah. I am a member of a running club The Dorset Doddlers, and I’d say without their company on the long runs I am not sure how I could have got through the mileage required to get to the starting line with half a chance of completing the race. They are supportive, encouraging and their witty banter is always welcome when you are 10 miles into a 20 mile run 7am on a Sunday morning and it is pouring with rain. I am up to 22 miles for the long runs and I average around 35 miles a week. I have not had any injuries (touch wood) that have impacted my training but I am learning at age 53 that I need to nurse my body through this adventure so I stretch for England and cross train, cycling, spinning and swimming to give my legs some rest, though they may argue differently. I have not thought about or changed my diet so far but I am aware that I will need to focus on this leading up to the last few weeks before the race, though I have rediscovered my love for sweet tea. I am also aware how quickly the race is creeping up, only 7 weeks to go but I have to say that I am really looking forward to the day. I have always loved running races and this one is special. The atmosphere and support is a heady mix which I shall enjoy and hopefully employ to my advantage and run to my best in the knowledge that my wife and children, family and friends will be cheering me on along the way. I am really privileged to be running on behalf of FRANK Water. I became aware of the charity through Bart who support FRANK Water and was proud to be offered a place in the race. I used to work in tea and spent much time in India sourcing teas so it felt appropriate to be involved with a charity where I felt I could help give a little back to a country I have been involved with and loved for over 30 years. I have set up a Justgiving page and now focusing on the other hard task of raising funds, leaving no stone unturned. You can support me here and help provide life-changing safe water and sanitation to people living without. As CEO of FRANK Water, my dream has always been to fund safe water. But with no personal experience in development - other than what I’ve learnt since I started FRANK in 2005, I’ve had to employ experts to support the development and growth of the charity. Keeping costs in mind, we now have two part time programme staff in India, who coordinate the work with partners and provide them with ongoing support, which also means that we don’t have to spend our hard won donations on so many flights to India. Hosted in Dovey Yacht Club, Wales, the simple, effective series of Ordinary Lives? talks not only raise money for FRANK, they attract unexpected adventurers, entrepeneurs and businesspeople with fascinating stories to tell. Here, Katie, one of the three brains behind the series updates us on the story so far and what to look forward to in 2017. The most recent ‘Ordinary Lives?’ event took place in Dovey Yacht Club on the 11th of December. These talks are designed so that local people with supposedly ‘ordinary’ lives can share their weird and wonderful experiences. These events raise money for FRANK water that work with communities to provide access to clean, safe water and sanitation through sustainable methods http://www.frankwater.com. The most recent talk was done by Bob Tyrell with the story on how his family’s name became one of the most successful formula 1 teams in the world. Also, a great talk was Nick Dawson’s experience dog sledding in Sweden. Sound ‘ordinary’ to you? Make washing your hands a handwashing habit. Sink, water, soap - splish, splash, splosh. Bottled soap, soap bar - go for it - grab it! This poem is a Triolet. A Triolet stems from medieval French poetry and is a poem with eight lines. Its rhyme scheme is ABaAabAB . The first, fourth and seventh lines are identical, as are the second and final line, which make the first and final couplets identical. Global Handwashing Day is Saturday 15th October 2016. Without understanding the importance of handwashing and hygiene, safe water and sanitation are made redundant. Read our report into how we changed people's attitude to handwashing and their behaviour in two districts in Chhattisgarh. Saturday, 28th May 2016 is Menstrual Hygiene Day! Did you know that 10% of all girls in India think menstruation is a disease?